A: Q: I want to change the color of the pink tiles in my bathroom. Can I have them reglazed? 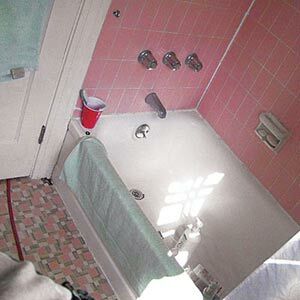 Kevin O’Connor replies: According to Mark Ferrante, a tiling contractor who often works with This Old House, the only way to reglaze your tiles would be to crank up the heat in your bathroom to 2,300 degrees for several hours. But there’s an easier way to get rid of the pink: with paint. With either method, the grout and tile have to be in perfect shape because the coatings will magnify any imperfections. ­Also, all the grout lines will end up being the same color as the tile. So if you want the grout to be a contrasting color, you’ll have to install new tile.